The Boston Crusaders had the honor of representing the State of Massachusetts and the entire drum corps community during the 57th Presidential Inaugural Parade in Washington, D.C., on Monday, Jan. 21, 2013. We're on, we're on! Watch CSPAN now! We are grateful for the support and kind words from all. This has been an awesome experience for us and we are proud to represent the drum corps activity. Many thanks! 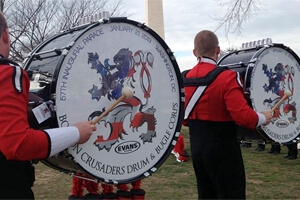 Boston Crusaders had the honor of representing the State of Massachusetts and the entire drum corps community during the 57th Presidential Inaugural Parade in Washington, D.C., on Monday, Jan. 21, 2013. This is the second time the corps has taken part in inaugural festivities, having previously marched in the 1965 Inaugural Parade of Lyndon B. Johnson.